Provost Don Nieman, Ruth Bass, Robert Bass and School of Management Dean Upinder Dhillon (left to right) unveil the sign for the newly named Bernard M. and Ruth R. Bass Center for Leadership Studies on Sept. 14, 2018. Image Credit: Jonathan Cohen. Provost Don Nieman, Ruth Bass, Robert Bass and School of Management Dean Upinder Dhillon (left to right) unveil the sign for the newly named Bernard M. and Ruth R. Bass Center for Leadership Studies on Sept. 14, 2018. Photography: Jonathan Cohen. 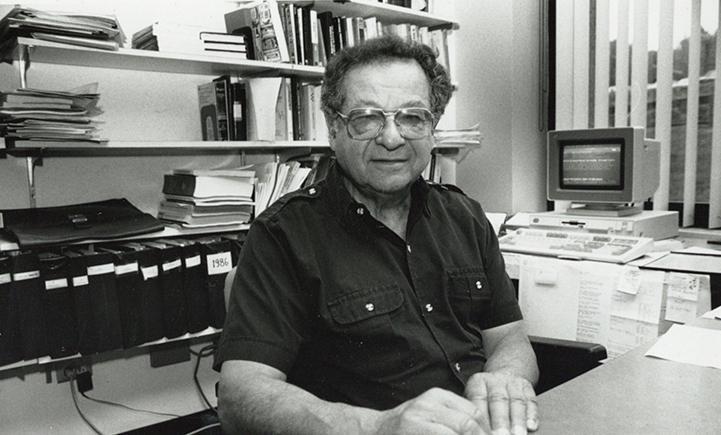 The late Bernard Bass is widely recognized in his field as a preeminent scholar in leadership studies who achieved worldwide renown for Binghamton University and The Center for Leadership Studies (CLS), which he helped establish in 1987. 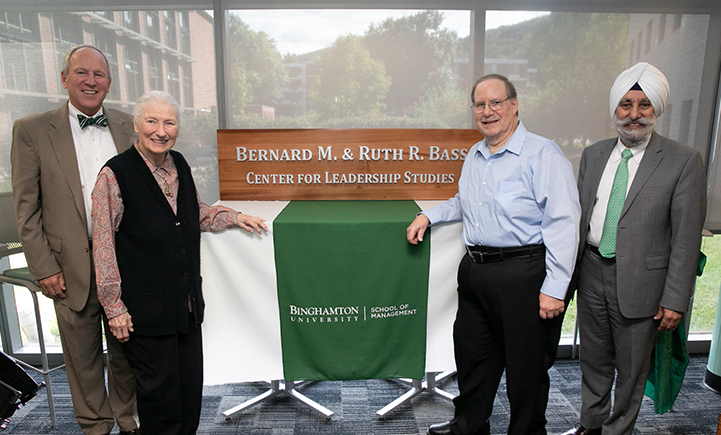 In September, the CLS organized research center was renamed the Bernard M. and Ruth R. Bass Center for Leadership Studies, honoring the profound effect he had on the center, the campus, his colleagues and students, and the couple’s generosity to support the center. 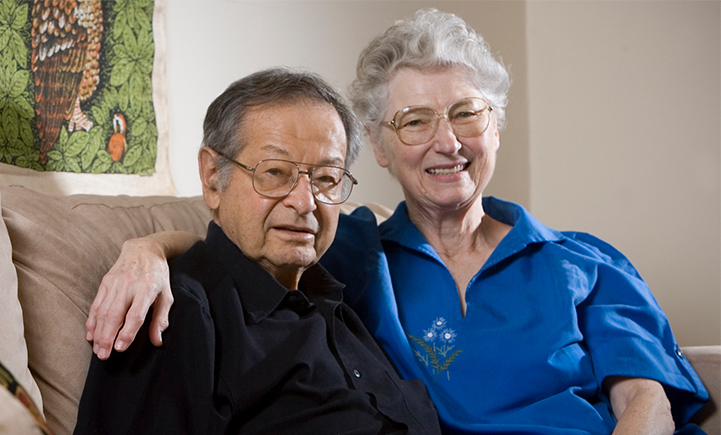 Bernard and Ruth Bass, photographed at their Binghamton home in June 2007. Image Credit: Jonathan Cohen. Bass was distinguished professor emeritus in the School of Management (SOM), founding director of the center and author of hundreds of articles and dozens of books on leadership, behavior and management. Ruth Bass worked closely with her husband on numerous projects throughout his career and was instrumental in helping him complete his last research text, the fourth edition of The Bass Handbook of Leadership: Theory, Research, & Managerial Applications. Current research by the Bass Center for Leadership Studies includes a multiyear project with the Center for Applied Social Research at the University of Oklahoma to build and validate planning and leadership models for the U.S. Army. Learn more here. Her generosity supports the annual Bass Speaker Series, hosted by the center and held at Binghamton each fall. This year’s speaker was John Antonakis, invited to campus from Switzerland, where he is a professor of organizational behavior and director of the PhD program in management at the University of Lausanne. He is also editor-in-chief of The Leadership Quarterly journal, whose founding editor was Bernard Bass. Bernard Bass was a mentor and role model for several generations of Binghamton faculty and students, according to Dean Upinder Dhillon. The center continues to honor Bass’ vision by remaining at the forefront of innovative leadership research and education. Bass was the primary reason John Joseph Sosik says he pursued his doctorate at Binghamton. Sosik graduated from SOM’s inaugural PhD program in 1995 and is now a professor of management and organization at Pennsylvania State University. Bernard Bass Image Credit: Evangelos Dousmanis, Binghamton University archive. Sosik adds that he’s developed four Penn State masters-level leadership courses based on what he learned at the center, with the most popular course based on the Full Range Leadership Development training that was offered by the center to Southern Tier corporations. That Penn State course was so popular with MBA students that Sosik developed an entire graduate degree program around it: Penn State’s Master of Leadership Development, in existence for nearly 14 years. For Jayoung Kim, PhD ’18, the Bass Center for Leadership Studies offers a “collegial and stimulating” environment in which to share ideas and learn from faculty and other students. Kim gained additional opportunities to expand on what she learned in her SOM management courses when she received essential financial support from the center to attend an educational workshop in Detroit and a Society for Industrial and Organizational Psychology conference in California, where she presented a paper.